Is undisclosed, paid PR the new normal in politics? 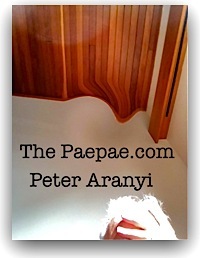 It’ll be no surprise to readers of ThePaepae.com that I despise behind-the-scenes, subterfuge public relations and opinion shifting efforts, especially if they’re funded in a non-transparent way. By coincidence, if you examine the tags dirty PR and dirty politics on this blog, the same cast of characters keeps on appearing. Over time that can make me appear… a bit fixated, I admit. But in reality, it’s just that I have an attention span, I’m interested, and these roosters just keep coming up. So I just run with it. Here’s how Mediawatch reported an episode of dirty PR yesterday… Turning up the noise on an unlikely ‘teal deal’. You can read host Colin Peacock’s article there at Radio NZ and listen to the 11 minute segment, or the whole Mediawatch episode. I subscribe to the podcast, which is always good. As Mediawatch reported, vastly experienced political reporter Richard Harman also observed the campaign, and described it as having ‘sinister overtones’… and oops, look who he says was ‘at the forefront’. David Farrar and Matthew Hooton. What a coincidence. Wouldn’t you like to know who was paying for this PR campaign? I would too. But for some reason telling us is not seen as a priority for savvy political reporters. Rob Hosking, writing for the National Business Review, described in vague terms how ‘some people are being paid to spruik the idea of a Teal Deal’, without, crucially, telling us who. As usual, it is being put down to “dirty politics” – which, for a growing mind-set of left-wing activists, simply means any political tactic they do not like and have no real answer to. There are also grizzles that some people are being paid to spruik the idea of a Teal Deal. Firstly, what National is doing here is hardly dirty – although it does strain the credulity of all but the most gullible. On the second point: People are quite likely being paid to shop the idea but so what? People get paid to shop around pretty much every idea in politics, from trade unionists to business lobby groups. And it’s hardly an argument against the idea. In his Mediawatch interview, Rob Hosking explained how he never actually talked to anyone “who was pushing it” and explained (ultra-vaguely) how he picked up the idea just by what was being said. Frankly, as much I as like and appreciate what Rob Hosking does, I found it awful to hear his equivocation about this. ‘People get paid to shop around pretty much every idea in politics’, he said. But should journalists collude like this? ‘Source protection’ for paid PR flacks running campaigns with undisclosed paymasters for undeclared agendas? This strangely tolerant, symbiotic relationship with PR — complete with We’re-all-adults-here-let’s-not-bother-the-readers-with-a view-of-how-the-news-sausage-is-made attitude — is not how I see the role of the Fourth Estate. What happened to ‘Without Fear or Favour’? Rather, I’m with Richard Harman who described it as ‘sinister’. 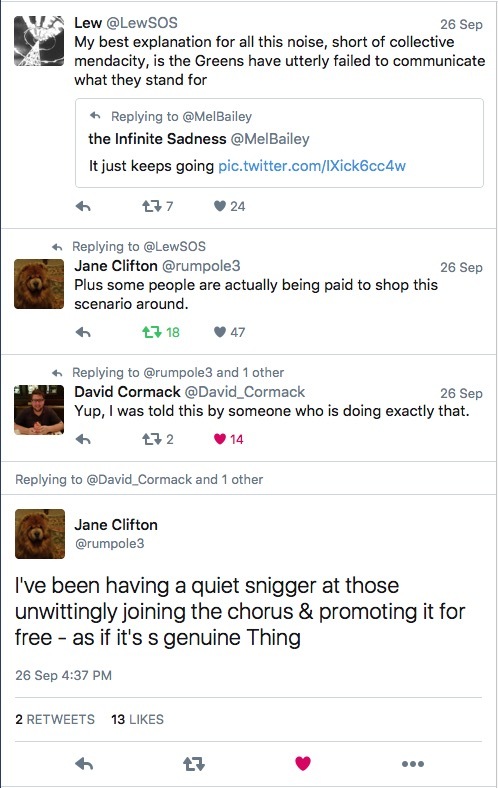 Or Jane Clifton who chortles at it, but calls it out in her way. For the National Business Review to more or less describe it as business as usual in these terms seems disappointing. To effectively normalise the subterranean dirty PR of Hooton and Farrar et al – to ‘protect’ it – makes a news outlet sound compromised to me, and actually seem less trustworthy, notwithstanding that some excellent people (including Rob Hosking) whose work I respect, work at the NBR. It seems to me that the media were looking to fill dead space and the blow hards behind all this were looking to create the illusions of options for National and instability in the Labour-Green bloc. And the comparison with trade unionists is absolutely facile. For starters, trade unionists are the members of trade unions, not the employees. And secondly, it’s clear to all involved whose views are being represented when employees or representatives of trade unions speak on public matters. The worry is that others start to buy-in to the thinking of the paid manipulators. For example, today the ODT ran an editorial in which they argued that the Greens had weakened their bargaining power by giving themselves no options. I agree, it wasn’t a ‘game’ without consequence. It was akin to a destabilization campaign aimed at the Greens. Yes, I think Rob Hosking was quite right to cite the ‘vaccum’ factor. News media and politics addicts had to talk about something right? The propagandists are playing a long game. What exactly do you think is sinister about it? The idea is not that new, Greens have worked with National before and in other countries Greens have formed governments with the Conservatives. So it’s not that a radical idea and certainly not one that is outright false, a lie or defamation. What difference does it make whether a PR guy like Hooton gets paid to float the idea or Paula Bennet gets paid to float the idea? DPF was pushing the idea way too hard to be taken seriously. It was clearly aimed at weakening NZF bargaining position and simultaneously painting the Greens as pig-headed and inflexible. But that is all legitimate politics, in my mind. While I agree with your concerns re undisclosed PR and politics, I don’t think this story is the hill to die on. If someone really paid Hooton (or DPF) to float this idea, someone just wasted some cash. Agreed, it’s not a hill to die on. (I hope I don’t sound that shrill about it?) My interest/criticism (in this instance) is the cosy collusion of elements of the news media. I’m not suggesting censorship, just the opposite. Tell me what’s going on, and who is behind it? I can’t speak for Richard, but I read his use of ‘sinister’ in that context more as the ‘malicious and underhand’ meaning, rather than ‘evil or criminal’. Both offered by my phone’s COD. Let me question your description of the campaign as ‘legitimate politics’. Really? But as I said, my interest is in the news media’s playing the game, being used as a political tool. Peter, I did *not* say some people are being paid for this because I don’t know that that’s true. My full sentence – which you really should have quoted – was “There are also grizzles that some people are being paid to spruik the ideal of a Teal Deal around,” which does not actually say that those grizzles are accurate. I don’t know that they are/were. There were a few comments on the Twitter about it and that seems to be the main source. It seems to me to be a relatively harmless, if fruitless, thing to do with their money if people are doing such a thing. It isn’t going to happen. There is the contention that this was going to somehow disrupt the coalition talks but if so – which I doubt – I can’t see how and why it would do so. It’s an interesting idea, which is why I wrote about it. It’s interesting because it won’t happen, but under MMP, something like this should not be as outlandish as it is. I agree with you, Rob. That’s why, of course, I actually did (and in context). It’s the third line of the block quote. I’d be happier if you and your colleagues did some reporting on the source and paymasters of the [alleged] PR campaign. How about it? Instead of making Twitter gossip the story, or playing the ‘We’re so savvy we laugh at these so-called dirty PR games, with paid flacks and proxies shopping ‘ideas’ around that only the most gullible would fall for. (Not us, of course, nudge, nudge, wink, wink)’ game. I’ve expressed my disappointment with what I see as slippery collusion and news media equivocation/portrayal of deceitful, hidden-from-view PR machinations as somehow normal. In my view the recent effort wasn’t made for no reason or for entertainment, out of boredom. It was clearly aimed at achieving political advantage. I don’t believe the goal was to actually encourage a National-Green coalition at all — therefore it was a deceitful effort with an undisclosed purpose. You say you think this was ‘relatively harmless’. We disagree on that. Enough said. The ‘Teal Coaltion’ is an idea that’s been used to whack the Greens as somehow hypocritical for years. Idiot/Savant’s No Right Turn blog is the first mention I saw of the idea by that name in 2011 (although I note Toby Manhire claimed he used it around the same time on the Listener blog). So who’s right? 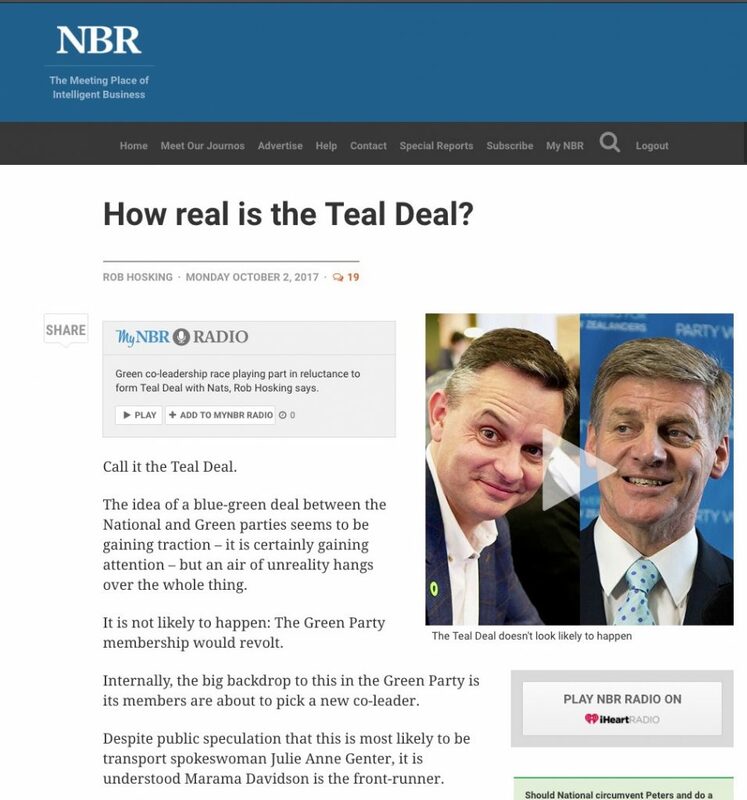 Is there any real prospect of the Greens supporting National to form a teal coalition? On this, I think I’ll defer to the Greens themselves, who said at their AGM earlier in the year that it was “highly unlikely”. Being a party of policy rather than tribalism, they’re not willing to rule it out entirely. But being a party of policy, any assessment is going to be based on the merits, and the degree of compatibility between National and Green positions. And any honest assessment would show that the two parties are deeply incompatible. The Greens support clean rivers. National wants farmers to dirty them for greater profits. The Greens want action on climate change. National is still a party of deniers, who wants to subsidise polluters. The Greens want an end to offshore drilling. National’s plans for economic growth are predicated on it. The Greens want to reduce inequality. National wants to increase it. Unless National changes its position on most of these issues, then there is no hope of the Greens putting National into government. And if people think that the Green leadership will be seduced by the baubles of office, remember that its the wider membership who will have the final say on any arrangement. I think its “highly unlikely” that they would support any arrangement which saw the Greens providing confidence and supply to the current National Party. But if they do, well, they’ll get what they vote for. Coalition with a friendly party with a high degree of policy compatibility is fraught enough. Coalition with a party fundamentally opposed to your values seems to be a slow and unpleasant form of suicide.